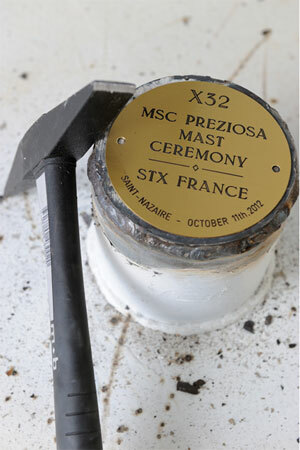 STX Shipyard in Saint-Nazaire, France welcomed MSC executives in the time-honoured tradition of welding two commemorative coins to MSC Preziosa’smast radar yesterday. A significant milestone in the construction of the 140,000-tonne vessel, MSC Preziosa will be the 13th addition to the line’s fleet and the fourth in the Fantasia-class series when she is christened in Genoa, Italy on 23 March 2013. “I am delighted to celebrate this important milestone in the construction of MSC Preziosa, the magnificent vessel that will complete our celebrated Fantasia class,” MSC Cruises CEO Pierfrancesco Vago said while opening the ceremony. 1,000 people are currently working on the construction of the vessel that boasts 30,000 tonnes of steel, over 771 kilometres of cables and 1,751 guest staterooms. 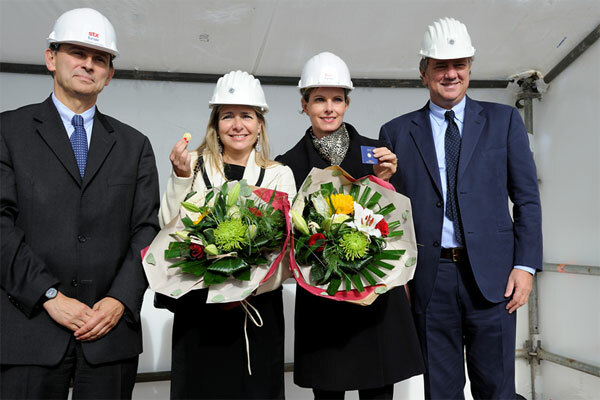 MSC Cruises head of onboard marketing Daniela Picco acted as godmother during the ceremony presenting the coins with STX France’s Jeannette Le Queau who has been involved with MSC since the first new-build orders were placed at Saint-Nazaire ten nearly 10 years ago. “It is STX’s ambition to support MSC as they become the European leader in the cruise market,” STX France general manager Laurent Castaing said. MSC Cruises is set to deploy nine ships from MSC Preziosa’s christening port of Genoa in 2013 as part of their commitment to the city that will also see nearly 930,000 passengers embark, disembark or transit during a total of more than 200 ship visits.